Are you ready to experience the flavors of Germany? The charming mountain town of Helen, Georgia is the perfect place to get a taste of old world Germany without ever having to leave the United States. With its cobblestone alleys and Alpine architecture, you'll really feel as though you've travelled to another place in time. Pair that with the tempting aroma of German cuisine wafting from excellent local eateries like Bodensee Restaurant and you really won't believe that you're not in Germany. Bodensee Restaurant takes its commitment to providing patrons with high quality and fully authentic Bavarian fare extremely seriously, and it shows. Be sure to put this eatery on your list of places to visit during your Helen vacation and prepare to have your tastebuds dazzled. Bodensee Restaurant was founded on the idea of providing customers with an exceptional dining experience, as well as truly authentic German cuisine. The restaurant's owners, Chef Aurel Prodan and his wife Doina are experienced in the craft of hosting guests with warmth, and firing up flavorful dishes of superior Bavarian fare. Chef Aurel's history in the culinary arts began with schooling and training in Romania as he studied hotel and restaurant management. After completion, Chef Aurel and Doina spent several years working has a chef and waitress in a local Romanian restaurant. In 1981 the couple departed Romania and moved to Bavaria, Germany where Aurel learned how to cook up authentic German dishes for nearly a decade. Next, they moved to Baban-Wuretenberg (Schwabenlad) at which time Aurel become a renowned Master Chef. These days, Helen, Georgia is fortunate to have the pair living right here in the Alpine village, operating Bodensee Restaurant and wowing both locals and visitors with delectable German cuisine. 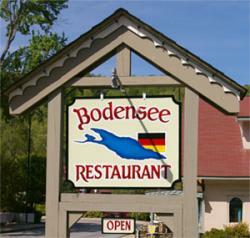 Bodensee Restaurant serves up lunch and dinner every day, starting at 11am. If you're in need of grabbing a quick bite to eat midday, you'll have plenty of options for both the light and hearty eaters in your group. All lunch items are served with a small salad to get things going. For those with a smaller appetite, Spatzle (German pasta) is always a great option. You might also want to go with a mixed salad platter - you can choose from cod, shrimp, grilled chicken, or wurst. If you're feeling pretty hungry during the lunch hour, we'd definitely recommend the homemade garlic wurst which is served with mashed potatoes and Saurekraut. The Chef's chicken Schnitzel is another satsifying option, served with fried onions, mushrooms, bacon, and cheese. Dinner at Bodensee Restaurant is always fabulous. No matter what you're craving, you'll find something to love. Red meat eaters will definitely enjoy the restaurant's delicious beef stroganoff, or the veal weiner schnitzel which is breaded and fried in butter. Poultry fans will delight in Chicken Schnitzel, or a lighter chicken breast served with a homemade mushroom cream sauce. One of the restauran'ts hottest items is a whole park tenderloin with garlic sauce, however, keep in mind that prep time for this spectacular dish is 30 minutes. For something a bit on the smaller side, go with the pork loin grilled with herb butter, pork schnitzel, or Holzfaellersteak, which is grilled pork loin served on toast with mushrooms. Other German favorites include the beef roll with red cabbage, Hungarian goulash, homemade wursts, and Sauerbraten with potato dumplings. Not sure what you want? 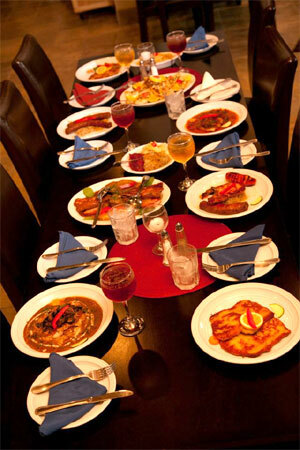 Pick the sampler platter for 2 and try a bit of everything. Got pickier eaters in your group, or someone not in the mood for German? No problem. Bodensee serves up fresh Georgia mountain trout, shrimp scampi, ribeye steak, prime rib, and other American favorites. Be sure to save some room for dessert - your tastebuds will thank you for it! Chocolate lovers will go gaga for the black forest cake. Other options include apple strudel a la mode, vanilla ice cream with hot raspberries and sweet cream, and a pancake with vanilla ice cream and sweet cream. Yum! Do you have an itch to be a star? Everyone gets their chance to shine when they grab a mic, pick out a fun son, and belt out a tune among family and friends on Karaoke night. Bodensee Restaurant offers Karaoke every Friday and Saturday evening, which is always a lot of fun for everyone. Even if you don't like to sing, you'll be wildly entertained by the folks taking a crack at getting in the spotlight. For a quieter atmosphere, you might consider taking advantage of the Bodensee's outdoor patio seating. Here you can enjoy your German favorites while taking in the fresh mountain air - and you can even bring Fido along! Which Bavarian dish are you excited to try during your visit to Helen's own Bodensee Restaurant?